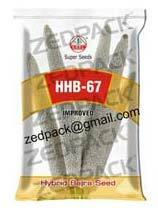 We are the famed Manufacturer, Exporter, and Supplier of Non Woven Wheat Seeds Bags in India. These Non Woven Wheat Seeds Bags are available in all sizes and shapes, as per the special requirements of the clients. These Non Woven Wheat Seeds Bags are known for their high quality and fine stitching.